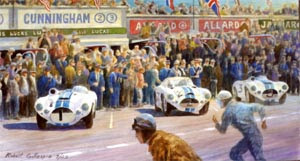 Three C4-Rs were entered by the Cunningham team for the June 14th running of the 1952 24 hours race. In the dramatic moment shown, the flag has dropped at 4 P.M. and the drivers are running to start their cars. Car #1 was driven by Briggs Cunningham and Bill Spear. 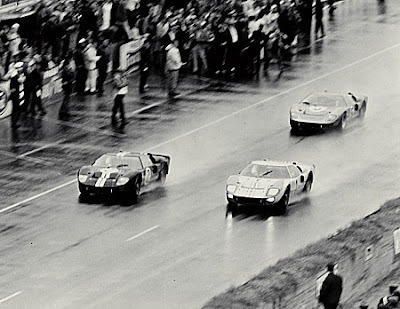 Ford dominating the 1966 running of the 24 Hours of Le Mans. Ford's GT40 Mark IIs finishing 1-2-3. This print celebrates Phil Walters’ second victory at Watkins Glen. Here, Bill Spear’s Ferrari 375MM and Walters’ Cunningham C-4R duel for the lead under threatening skies on the very fast Baker hill Road section of the interim Glen circuit. Walters commented that this second track was “a course for brave men”. Have you ever wondered where racing stripes originated? Many auto enthusiast will tell you they were to make it easier for the crews and fans to tell the cars apart especially when teams had multiple cars in the same race. Then there is the old wives' tales that the older drivers made new drivers apply a stripe to their cars, so as to mark their lack of experience. If a new driver could prove themselves to be a clean driver they would be allowed to race without the stripe. Obviously anyone who had a stripe was subject to mockery and sarcasm. Now the facts.... Years ago when auto racing became an international pastime many race cars body styles were similar in appearance thus difficult to tell exactly who was who. Colors were agreed upon in the early days of auto racing and standardized in the Code Sportif International (International Sporting Code), Appendix I, of the Federation Internationale de L'Automobile (FIA). The color was associated with the nationality of the car's owner; hence, an Italian car raced by an Englishman would be painted British racing green. This was a way for the cars to be identified as to country of origin, and here are just a few examples. The FIA no longer requires that race cars follow this color code. Their web site states explicitly that Formula 1 cars, for example, are exempt from national colors. At the time, white with blue stripes was considered to be the American road racing colors in international racing so when Peter Brock came on with Shelby it was determined that all the 1965 GT 350's were to be painted white in color. Brock had an idea... One of his first cars was painted white with two wide blue stripes. 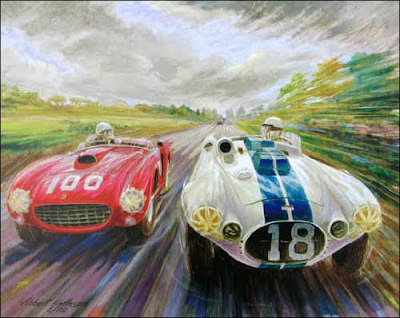 It was painted this way as a tribute to the Briggs Cunningham road race cars of the 1950's, which also raced in Europe. This is where Lucky's white base body color with twin blue Le Mans stripes that are forever linked to the 1965 GT350 came from and we will proudly wear those colors to represent the United States. Class dismissed. Let's go racing! Here is a list of distinctive national colors assigned to vehicles taking part in international competitions. NB: The use of distinctive colors of nationality is compulsory when the supplementary regulations of the competition require it. These colors are determined by the nationality of the competitor. P.S. For those countries ignored by the FIA when the national color standard was abandoned, CART could make provision to reserve the colors of their national flag where there was no conflict with an existing standard. Colombia is an example which falls readily to mind. I have a 58 Triumph TR3 and have been trying to come up with the color code of the yellow that Belgium race under...Only because my dad was Belgian. I tried the Belgian fomula one team and they could't help. They sent me to the national team site and it has been about 3 weeks with no reply. I am beginning to assume that there really was no true specific color selected, but just as long as it was yellow it was OK. Is this true? I mean there is British Racing green and Italian red and all you need to do is ask for it and the paint companies will mix it for yor. But Belgian Yellow...You just get " The Look"
Ethyl... fruit of the vine. Who said it won't rain? Hey... Put a lid on it, will ya! Just a little trim on the top please. What's Red, White & just Blue your doors off? Hey the shed is missing!